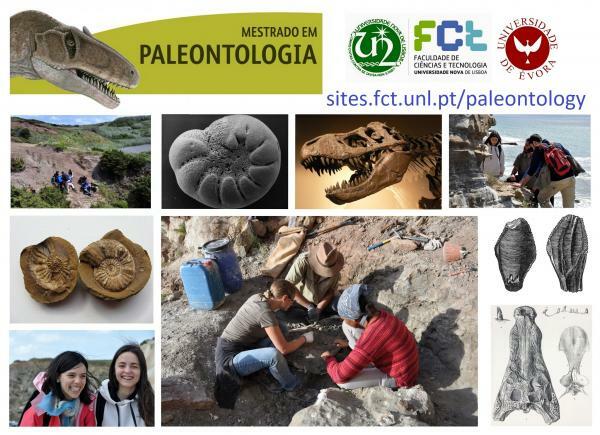 The Master in Paleontology programme is offered as a join association between FCT-UNL NOVA University of Lisbon (Faculty of Sciences and Technology) and University of Évora, in Portugal. Started in the academic year 2012/2013. The minimum number of credits for the degree is 120 (2 years). The overall objective of the course is to train postgraduate students with a comprehensive and integrated understanding of the current issues of the evolution of Earth and Life. Despite the obvious added value in terms of quality and complementarity by the union of two universities in order to prepare a course of study, it is believed that this MSc will promote a set of cohesive lessons, worth employability and to act as protection and socio-economic recovery of the paleontological heritage. Apart from that, this MSc will fill a gap in terms of offering specific training in this area. Provide a strong foundation and knowledge in the area of paleontology allowing the future graduates to make conscious initiatives regarding the paleontological / geological heritage. Gain skills that provide the graduate with a high degree of autonomy to further develop and acquire a lifelong training in related disciplines and paleontology, with a high degree of autonomy. See Careers and where are our ex-alumni. Daytime, Presencial on campus at FCT-UNL and UÉ.